It measures 105.8 mm x 51.0 mm x 13.8 mm (L x W x H) and weighs 93g – that makes it a similar size to the (imminently) forthcoming C6-01, and quite a bit smaller than the Nokia N8 or C7. It comes with up to 40MB of user memory and support for MicroSD cards up to 16GB. 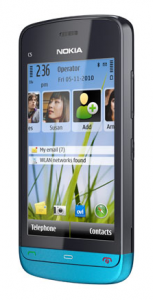 The talktime is quoted at 11.5 hours for GSM use and 4.5 hours using 3G. Standby time is estimated at 24-25 days. The operating system is Symbian^1 (aka. S60 5th edition touch-edition). The two-tone colour scheme comes in both bold and restrained flavors and is expected to retail at around €170 before taxes or operator subsidies. Shipping to commence globally at the end of this quarter. Oh… It appears great, but the OS should be Symbian^3. It would be more expensive, if it comes with Symbian^3?